Francis was born in Theale in 1881, the son of Francis Jones and his wife Mary Emily née Steward. He was their eldest son, but far from their eldest child – he had four elder sisters. The couple’s total of eight children were: Alice Emily (born in Dibden, Hants, in 1874). Annie Kate (Hambledon, Hants 1875), Mary Bertha (Titchfield, Hants 1877), Fanny Edith (Theale, 1880), Francis Henry (Theale 1881), Maggie Winifred (Theale 1883), Rose Gertrude (Theale 1885), and Thomas Edward (Theale 1886). No 1 was the far cottage, now 11 Blenheim Road. 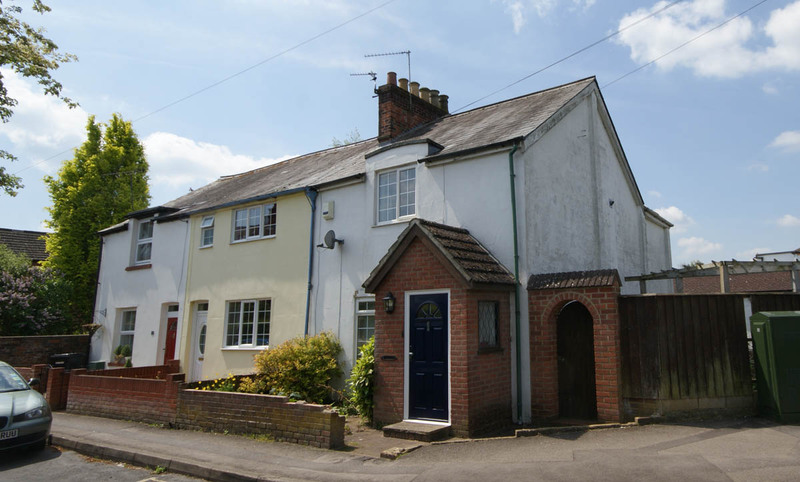 Francis senior was a police constable; he moved to 1 Church View, Blenheim Road, Newbury in 1888, probably directly from an earlier post in Theale. The previous tenant of the house was PC Gamble, whose place be may well have taken at work as well. Mary died in 1889 and Francis remarried to Kate Elizabeth Andrews in 1891. Church View was a terrace of four cottages on the corner of Blenheim and Russell Roads, No 4 was demolished to make the corner safer for traffic. In doing this the home of three brothers Richard, Benjamin and William Smith who died in the Great War was destroyed. Francis and Kate then had another family: Joseph William (born 1892), Frances Carrie (1894), Cameron Goddard (1895), Sidney Walter (1896) and Elsie Violet (1899). Cameron died in the first few months of his life and Joseph died at the end of 1909 aged 17. Even more tragically Joseph’s burial in Newtown Road Cemetery, Newbury, on 3 January 1910 was only three days after that of his father in the same cemetery on 31 December 1909. 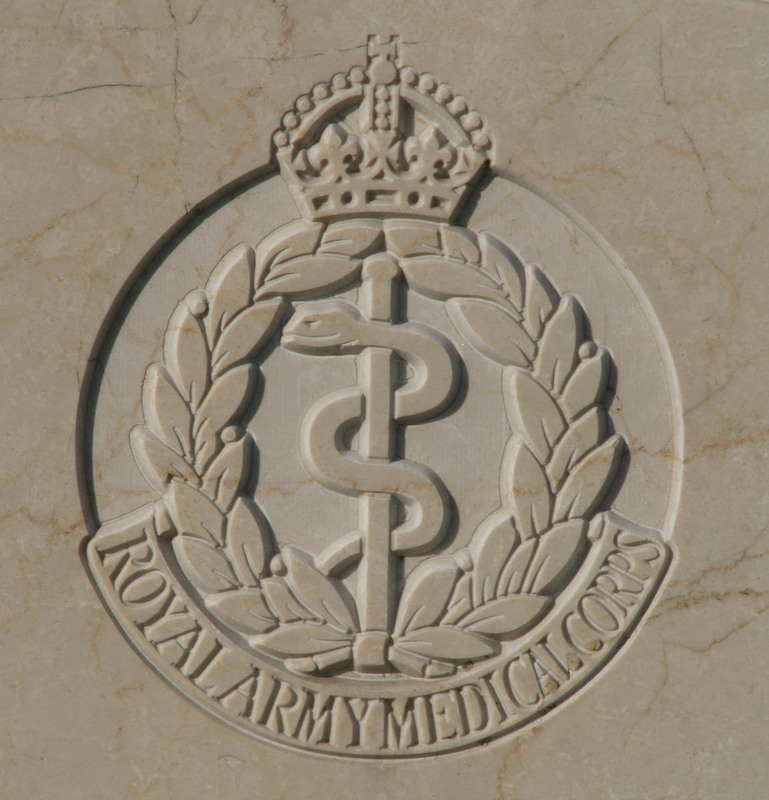 The regimental badge of the Royal Army Medical Corps, as used on CWGC headstones. Francis junior opted for a career in the Royal Army Medical Corps, joining the army in 1897 at the age of 16. He served with distinction in South Africa during the 2nd Boer War. The normal service terms in the British Army meant that he would have had the option to return to civilian life after five or seven years as a member of the reserve. Francis opted to stay in uniform and signed up for extended service as a career soldier aiming to complete a term of pensionable service (21 years). He was reported to have won the Queen Victoria Medal for gallant behaviour in the field during the South African campaign – however, there was no gallantry medal of that name. The full explanation of this report remains a mystery. In mid to late 1909 Francis had a son, Francis Walter – shortly before he married Lilian Ada Andrews. Francis junior had a short life, dying aged six in 1916. However, he would have known his sisters, Edna (born 30 July 1914) and Elsie (17 April 1916). Three weeks after Edna’s birth her father landed in France with the British Expeditionary Force. Francis rose to the rank of Acting Sergeant Major – a Warrant Officer rank – demonstrating that he was held in high esteem by the senior officers commanding his unit. As his service record has not survived it is impossible to be sure about Francis’ service in France. When he died he was serving with the 4th Stationary Hospital, which was based in an old distillery at Arques, a village that abuts St Omer on the south-east. St. Omer had been the General Headquarters of the British Expeditionary Force from October 1914 to March 1916. It was also a considerable hospital centre with the 4th, 10th, 7th Canadian, 9th Canadian and New Zealand Stationary Hospitals, the 7th, 58th (Scottish) and 59th (Northern) General Hospitals, and the 17th, 18th and 1st and 2nd Australian Casualty Clearing Stations all stationed there at some time during the war. St Omer was also very important to the Royal Flying Corps as the site of No 1 Aircraft Depot (Saint-Omer). One of two depots through which all new aircraft supplies came to the front and where many damaged aircraft were repaired. As such it was an inviting target for German bombers. On 30 September 1917 there was an air raid on the town. Bombing was not confined to the Aircraft Depot, Nos 4 & 58 Stationary Hospitals were also hit. The arrival of the German aircraft overhead interrupted Francis’ letter writing – sadly he was not able to return to his letter home - he was among those killed. K.G. 1 griff Stadt und Flughafen St. Omer und umliegende Orte mit 9400 kg an; in St. Omer ein großer Brand. K.G. 4 bewarf Flughäfen der feindlichen Bombergeschwader und Armeeflugpark Longueneß mit fast 20 000 kg; zahlreiche Brände und Explosionen. K.G. 1 attacked city and airfield St. Omer and surrounding locations with 9400 kg; one big fire in St. Omer. K.G. 4 dropped nearly 20 000 kg (bombs) on enemy bomber wings and Army Flight Park Longueness; numerous fires and explosions. Big German Aeroplane raid started suddenly about 9.15pm. Five large bombs & one small were dropped on the hospital causing 4 deaths, 5 severely wounded & several lightly wounded cases, of which two at least will probably prove fatal. Ten other bombs mostly large were dropped around the hospital most of which were evidently intended for the hospital. Much damage was also done, the dental surgeries & mechanics workshops being demolished while the body of a Ford car was destroyed & all windows and shutters of the chateau severely damaged. A fire was caused in the anti-room of the officers’ mess in the chateau by a lamp being upset by the concussion of the bombs; it was however quickly put out without much damage. Those on the receiving end clearly thought they were deliberately targeted. probably on 58 General Hospital (right). War Diary, Matron-in-Chief, B.E.F. - 1st October 1917.
. . . While here [8 CCS] I received a telephone message saying that there had been a severe bombing raid at St. Omer, when 58 General Hospital has suffered considerably, one Staff Nurse and 2 V.A.D.’s having been killed as well as 16 patients. One Staff Nurse had been seriously wounded and 2 slightly wounded as well as 67 seriously wounded patients. In consequence, I telephoned to the D.M.S. 3rd Army letting him know that it would not be possible for me to continue my work in the Army for the present. Left for St. Omer immediately after lunch arriving about 4 p.m. Reported to the A.D.M.S. office and then proceeded to 58 General Hospital, where I met the A/Principal Matron and the Matron, and where I found Surgeon General Macpherson had already arrived. The whole unit seemed shocked and dazed. Everyone spoke of the wonderful courage of the women. The raid lasted for some hours and the casualties occurred in the hospital where everyone was on duty. A tremendous lot of damage had been done, several marquees being blown to atoms and some of the Sisters’ quarters in process of erection simply perforated with shrapnel. A large German camp quite close to this unit with 500 prisoners escaped without any damage whatever. The same night, 4 Stationary Hospital, which is non-sisters’ unit, was also bombed and the Sergeant Major and 5 men were killed. All the stretcher cases were transferred to the buildings at 10 Stationary Hospital and 59 General Hospitals, only walking cases being left in the hospital, and the nursing staff were divided into two, one lot being accommodated at 10 Stationary Hospital quarters and the other at 59 General Hospital. Both these units have solid cellars. Francis was the Sergeant Major mentioned in the Matron's diary. The hospital diary entry for the following day included a list of the casualties, including Francis – as 12753 S Sgt (a/Sgt Major) J H Jones. Both his number and initials are reported incorrectly - confusion over his initials carried over to his burial, his headstone bears his name as F W Jones. JONES – in proud and loving memory of Sergt-Major Francis Henry Jones, of the RAMC, eldest and dearly loved son of the late PC Jones, who was killed in France, September 30th, 1917, by enemy aircraft while attending wounded at the 4th Stationary Hospital. Sergt-Major Francis Henry Jones, whose death is announced today, joined the Army when he was 16 years of age. He was in the RAMC, and had served through the Boer War, in respect of which he won the Queen Victoria Medal for gallant conduct in bringing in wounded. He went out to France in this present war in August, 1914, and was at home on leave as recently as July last. He wrote home on Sunday, September 30th, the day of his death, and in his letter he said he must stop writing for a time, as the enemy aircraft were over his head. The Colonel, in communicating the intelligence of his death to the widow, said he was killed by those machines he wrote about. He also said that he was one of the best men in the medical service in the Army. Deceased was the eldest son of the late PC Jones and Mrs Jones of 5, Brixton-rise, Newbury. Another son is at the front, serving as Sergt-Major; the other brother, Sidney, was killed in May, 1915, A brother-in-law, Rifleman Bert Harvey, is also with the Forces in France. Deceased was married, with a small family. 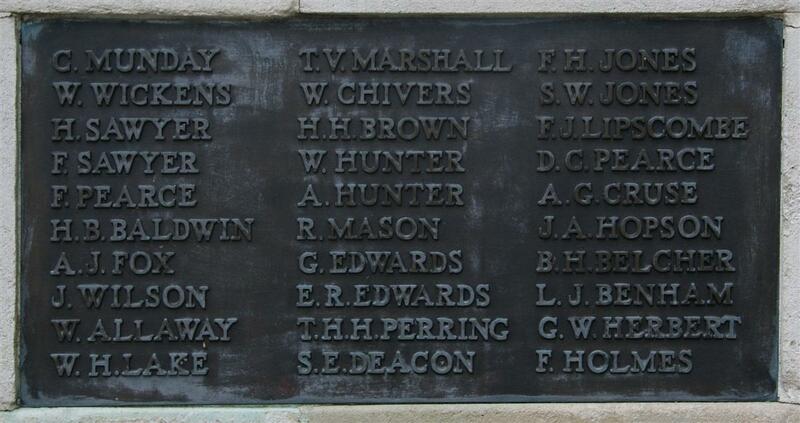 - for some unknown reason the Commonwealth War Graves Commission has incorrectly inscribed his initials as F W.
Locally Francis is remembered on tablet 3 of the Newbury Town War Memorial where his name is above that of his half-brother Sidney. Unlike Sidney he is not remembered on the parish memorial board and roll of honour in St Nicolas’ Church. He had not lived in Newbury for many years and it would appear that his step-mother (quite naturally) was more active in promoting the remembrance of her son than her stepson. Similarly there were no In Memoriam notices placed in the paper on the anniversaries of Francis’s death. Thanks to Jasta72s on the Great War Forum for the German report of the bombing. Special thanks to the late Sue Light for the Matron's diary entry and all her help in the development of my feeble understanding of things medical during WW1.